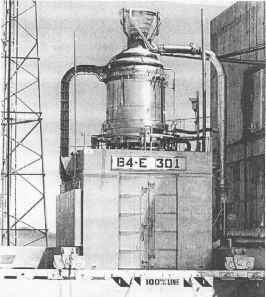 The next stage of power fusion research took place in the 1960s and focused on curing the "leaking" plasma problem at the two ends of the magnetic mirror. The idea was to bend the plasma sausage at the two leaking ends and join them: the result is no longer a sausage but a doughnut, in which B has two main components (one toroidal, its field aligned with the doughnut larger circumference(s), and one poloidal, the lines directed as the smaller cross-section circles). This is the tokamak reactor shown schematically in Figures 8.10 and 8.11. 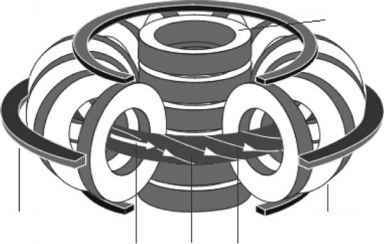 The tokamak configuration is still being experimented with in most fusion research centers. A tokamak in the strict sense does not lend itself to propulsion, since its geometry is closed: a tokamak was conceived only as a power generator. Nevertheless, just as in the mirror MCF machines, a high-energy plasma jet may be allowed to escape, for instance from the region near the axis of a tokamak torus: this becomes conceptually the rocket engine called reverse field configuration (RFC) and described in Section 8.12. Alternatively, the fused plasma may be ejected through a duct tangential to the tokamak torus, and called a "divertor"; see Figure 8.12. R. Bussard was the first to propose this solution; see [Bussard, 1990]. 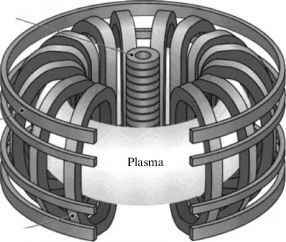 In both cases there are major problems to solve, since plasma needs to be simultaneously confined and escaping, all this at a controlled rate and while being ignited and fusing. Figure 8.10. Tokamak geometry and magnets. Figure 8.11. Plasma current and B field lines in a tokamak.